OC Bulls are performing under the toughest commercial cattle conditions in California, Oregon, Nevada, and Mexico. Oldest Hereford Herd in California (founded in 1918). 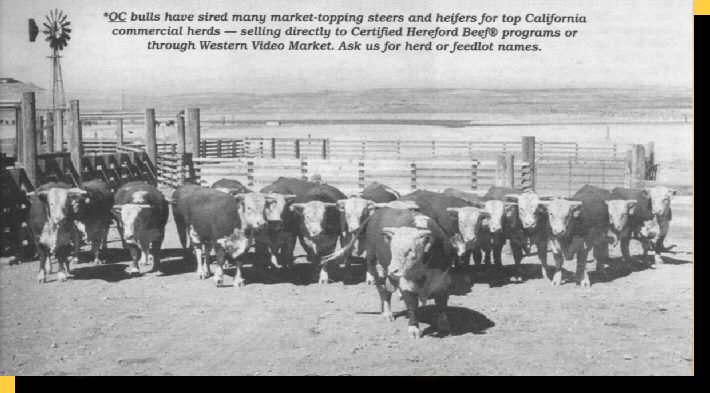 Designated "Historic California Hereford Herd". Ultra-sound testing since 1987 for rib eye, back fat, and marbling. Herd has produced both individual and pen sale champions. Calves grown without creep feed, bulls conditioned on grass up to 14 months old, and then are further developed on 20 acre fields on high-roughage ration, developing growth and muscling at the ranch. Johne's disease test pioneers - negative every year.